This seventh word reiterates what each of the previous six words have implied, namely, that there are no shortcuts to resurrection. 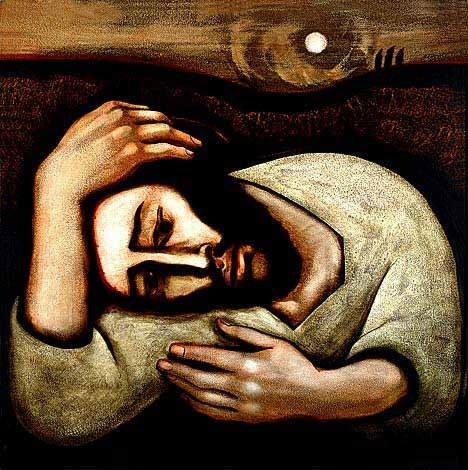 Richard Rohr says that we are tempted to skip over Good Friday to get to the Empty Tomb. We want to avoid the Cross and make an end run to the Hallelujah. That’s how many of us live our lives. If we just go faster, keep doing what we’re doing but with more energy and determination, then we just might make it. But the Season of Lent, the observance of Holy Week, and an extended Good Friday reflection upon the Seven Last Words of Christ forces us to slow down, to wait on the hallelujahs, and at the risk of discomfort spend some time in the shadows where not every outcome is self-evident. This seventh word sends us forth towards the washed out bridges of our lives. Those places where a great interruption has occurred. Where the way forward is no longer clear. It is a word for that liminal space between the Old Rugged Cross and Up From the Grave He Arose. That space between Good Friday and Easter morning. It is a word for approaching the washed out bridges and chasms of our days. And it begins with that unique title that Jesus had to describe his relationship to the God of Abraham, Isaac, and Jacob: the title Father. This seventh word like two of the previous words comes to us from the Gospel of Luke. Luke’s approach to telling this story is characterized by his emphasis upon the continuity between the ministry of Jesus and the death of Jesus. It is not just that Jesus died, but that the way in which Jesus died was consistent with the way in which he lived. The Jesus of Passion Week is the same Jesus as he who was baptized by John in the Jordan, who healed the sick, who fed the 5000, who preached good news to the poor. And nothing indicates this continuity quite so clearly as the continued utterance of this most intimate of expressions for God. At the point of the greatest crisis in Jesus’s life there is no breakdown, no wavering, no dissembling in front of the brutality of torture or the humiliation of public execution. Jesus could speak of Our Father on a quiet mountainside among friends and the same Jesus can still speak to his Father and upon a lonely cross surrounded by enemies. Jesus is quoting Psalm 31 in this cry of course; but Jesus makes this Psalm his own by beginning with this intimate parental term of relationship and affection. That Jesus can still find it easy to speak such words to God at this point in his life reveals a deep, deep, deep faith. A faith that goes all the way to the ground. Jesus had a faith that went all the way to the ground. It was not a pretended faith, or a Sunday morning faith. It was not a faith painted on the outside, but washing off in the first thunderstorm. No, it was a faith that went all the way to the ground. All the way to the cross. All the way through the shadows of Holy Saturday into the dawn of Easter morning. The faith that Jesus held his entire life now holds him at the point of his greatest need. Do you have a faith like that? When Jesus says Spirit here it is important for us to grasp that he is not talking about only a part of himself. For Jesus as a faithful Jew would not have believed that body and spirit were two separate parts of a greater whole. No, in fact, Jesus would have believed that his body was part of his Spirit, and to commit his Spirit was to commit the deepest, fullest, most essential and truest part of himself. Jesus is turning everything over to God. By doing this Jesus is demonstrating that Resurrection is never an achievement. Resurrection is never something we accomplish. There is no ten-point plan, no TED talk, no discipleship curriculum that will get us out of the tomb on Easter morning. We fully entrust ourselves; all of our selves. Two years ago I had the privilege to be at my Mother’s bedside during her final hours after a short and brutal battle with brain cancer. I held her hand and looked in her eyes and told her, “Mom, you need to let go. You aren’t going to get well. This is the moment you’ve been preparing for all of your life. It is time to commit your Spirit into the hands of God.” She died peacefully the next morning. Into God’s hands Jesus says. We do not commit ourselves into a void. There is no existential leap of faith. We commit our Spirit INTO THE HANDS OF GOD. This is important not just as an expression of Hebrew piety, but as an indication that there is our part and there is God’s part. Our job is to commit our Spirit. But it is God’s job to catch us in God’s hands. If we fully entrust ourselves we will be fully embraced. Fully entrusting, fully embraced. It is like that summer camp exercise where you fall into the arms of the waiting crowd trusting that they will catch you. We fall, we fall faithfully into the hands of God. Fully entrusting ourselves to be fully embraced. Sometimes in those difficult passages of life, in those dark nights of the soul, the only responsibility we have is to fall, to let go, to commend our Spirit into God’s faithful hands. Into God’s hands – with the final words you say.